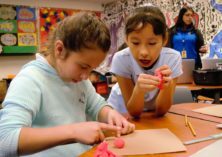 BASSETT, CA – Don Julian outgoing fifth-grader Cassandra Sam blended and shaped clay into the hues and textures of her favorite animal, a penguin, during an after-school art program. The program ran on Tuesdays and Thursdays during the school year for students in grades two through five. Students learned about famous artists’ techniques and works from different time periods to create personal art using the same medium and style. Color theory wheels, stenciled self-portraits and underwater-themed decoupage pieces decorated the walls of the art class, along with created art pieces of water-colored sun flowers in the style of Vincent Van Gogh and full-body silhouettes inspired by pop artist Keith Haring. Ana Meza, Don Julian’s art program coordinator and instructional assistant, provided background information on the selected artist and works, as well as on the respective art movement. English Language Arts standards were woven into the curriculum with students researching topics and critically analyzing famous pieces. Meza, who taught the art class in collaboration with Don Julian instructional assistant Jennifer Romero, encouraged students to submit their pieces in community art contests for the 2018-19 year. 061918_BASSETT_DJART1: Don Julian Elementary fifth-grader Cassandra Sam blends and shapes clays to match the hues and textures of her favorite animal, a penguin, during an after-school art program. Following a lesson on endangered animals, Sam and her classmates used Google images to study the shapes and colors before creating their clay models. 061819_BASSETT_DJART2: Don Julian Elementary’s after-school art program introduced students to famous artists’ techniques and works to create personal art using the same medium and style. The program ran on Tuesdays and Thursdays for students in grades two through five. Don Julian Elementary’s after-school art program introduced students to famous artists’ techniques and works to create personal art using the same medium and style. The program ran on Tuesdays and Thursdays for students in grades two through five. 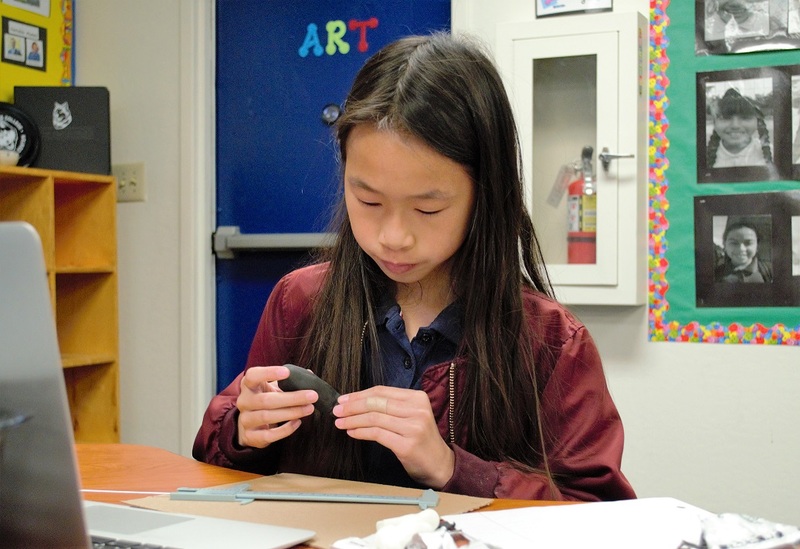 Don Julian Elementary fifth-grader Cassandra Sam blends and shapes clays to match the hues and textures of her favorite animal, a penguin, during an after-school art program. Following a lesson on endangered animals, Sam and her classmates used Google images to study the shapes and colors before creating their clay models.